A couple of years ago, I asked Karan what cake he wanted for his birthday? He said he didn’t want a cake this year (since I had made him a toilet bowl cake the previous year for his big 30) but wanted home made kulfi instead. 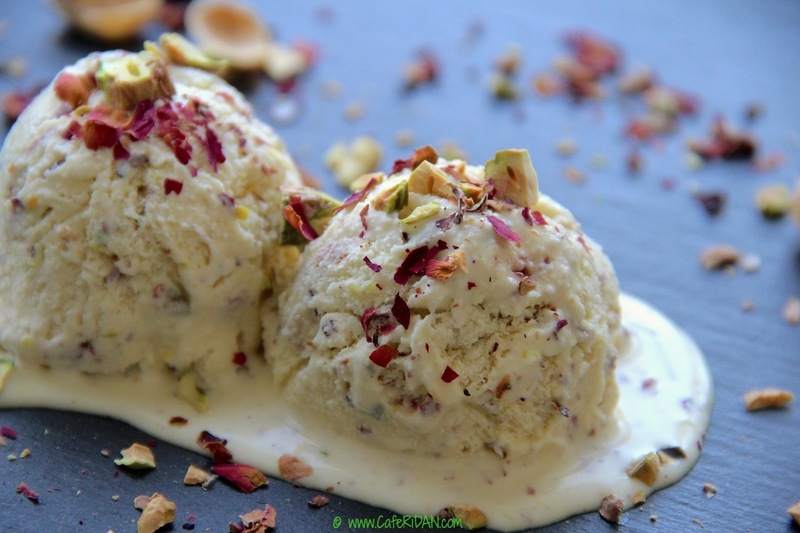 Kulfi is an Indian ice cream that is traditionally made by boiling full fat milk with khoa (made from reduced whole milk) till it has thickened. Then sugar and other ingredients are added to it. I had no idea where I could buy khoa in Phoenix or what I could use as a substitute. Our Aunt in California is an awesome cook and always has a substitute for every ingredient. As always she had a delicious recipe that was easy to make too. 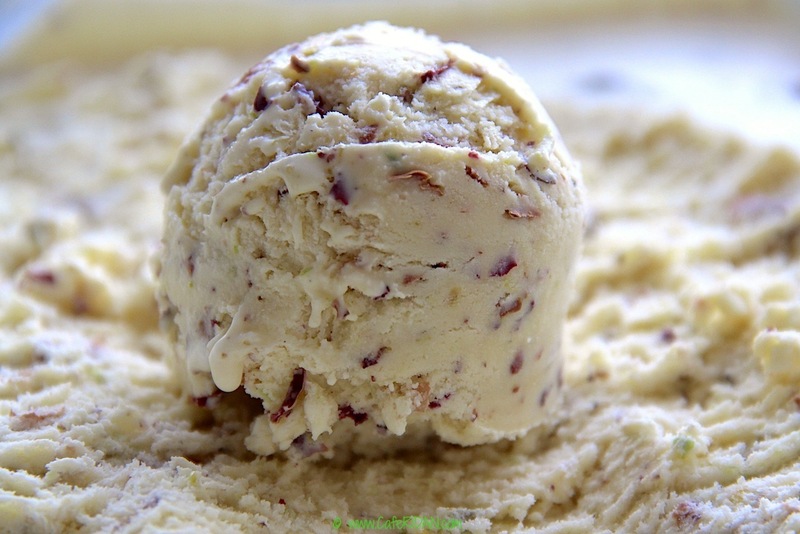 The base of the kulfi is evaporated milk, condensed milk and heavy cream. Just beat it together, add flavoring of your choice and freeze. Yes, it is as simple as that. Another great tip that she gave me was to add a slice of plain white bread (edges cut off), to prevent crystalizing and give the kulfi a creamier texture. Needless to say Karan loved it! I added cardamom, saffron, pistachio, dried rose petals and rose water for flavoring. The kulfi was delicious and creamy with a nice crunch from the pistachio. 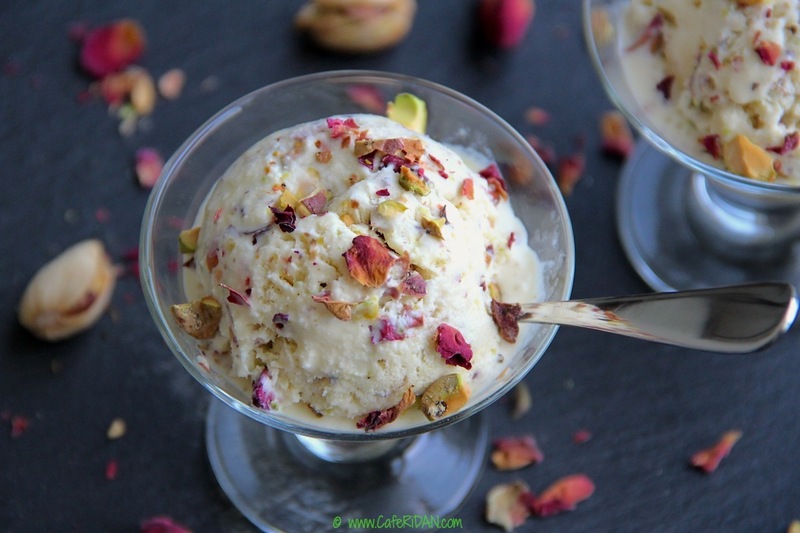 The saffron, rose water and petals added an amazing fresh, floral flavor that was very similar to the traditional Indian Kulfi. Soak the slice of bread in the evaporated milk. In a large bowl whip together cream, sugar, cardamom powder and saffron till soft peaks form. Then add condensed milk, rose water, evaporated milk with the bread and beat for another minute. Fold in the rose petals and pistachio. Transfer to an airtight container and freeze for 8-10 hours or preferably overnight. This sounds yum- how come I have never tried it???!!!! Ok, forgive you this one time but tell me- did you just use regular rose petals? Or something store bought??? Think my boys will love this too – maybe in a mango version. And that slice of bread??? Either genius or just odd- will get back to you! Have made this recipe a few times. Always a crowd pleaser and so easy to make! Love it!